It’s time for a break from information. But before that – bits of the past. The first coins in history most often are associated with the ancient kingdom Lydia. Situated near the coast of Aegean Sea, it was part of what is today western Turkey. 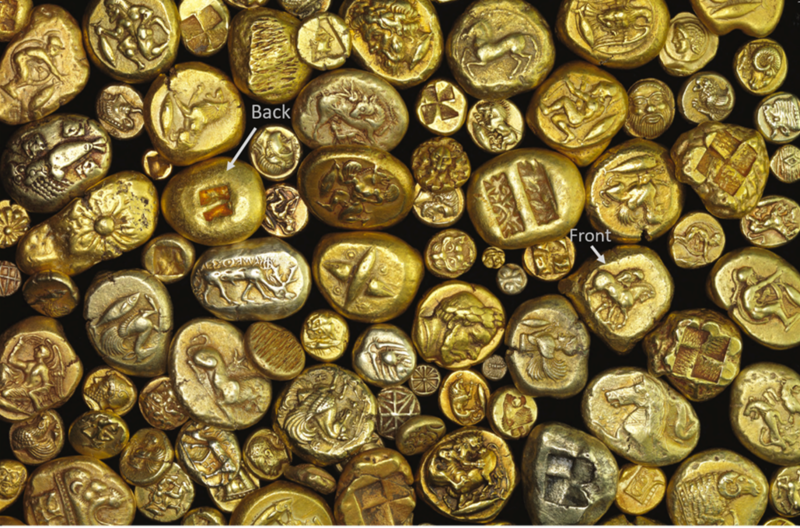 Although with little variations in mass, these coins were of irregular shape, one-sided, without letters or words, depicted some sort of animal and contained both gold and silver. Whether Lydians were the first to invent coins is debated among the historians but it is agreed that they were the first to make coins on a large scale and use them as money. That took place somewhere between 650 BC and 550 BC. Gold from which these coins were made was the basis of the kingdom’s economy. Question arises, where did they get their gold? Turns out the capital of the kingdom had the river Pactolus flowing through it – its sands carried gold in abundance. This gold was of pale yellow color, indicating at the presence of a decent percentage of silver. The type of gold which is naturally alloyed with silver is called electrum. 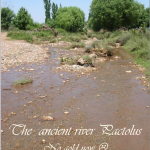 The river Pactolus had so much electrum that even today there is a saying “rich as Croesus”. Croesus being the last ruler of Lydia was the one who particularly benefited from the river. On top of that, people could not believe that so much gold could exist without some sort of magic, so a legend was born to explain its astonishing amounts. I came across this legend when surfing the Russian search engines and liked it to the point that read several versions of it. By coincidence, it turned out to be linked to an important event in a history of gold. Here is it, that’s a product of me reading four different versions of the legend. Once Dionysus, the god of wine, and his buddies including the teacher Silenus were on their way to Phrygia, east of Lydia. As usual, Dionysus was all about teaching humans how to grow and harvest grapes, how to make best wines and other winy stuff. Silenus, loving wine more than anything, drank too much of it this time and was badly intoxicated. He had a difficult time walking and hardly could keep up with others. After numerous stumbles and falls he finally lost sight of everyone. When somehow he managed to get out of the woods, to his surprise, the air there was filled with the smell of roses. With half open-eyes, he attempted to spot the flowers. In near vicinity, he could see a huge garden of flowers, all roses: yellow, red, white. “The perfect place to sleep the hangover off” he thought, and quickly fell into the deep sleep. It didn’t last for long as one of the guardians spotted the drunken and soon the old Silenus was surrounded by a couple of them tying his hands and body with rose stems. In moments, he found himself before the ruler of Phrygia, King Midas. About the king: he adored roses, especially yellow ones but gold was his real obsession. He immediately recognized the companion of the famous god and welcomed Silenus into the palace.